As a Torontonian, there is nothing I would rather do than wander around the city on my nights without the kids. Years ago, my hard working never to be seen husband and I decided that we would take a night each month and do just that. We have wandered through Nuit Blanche, Little Portugal, TIFF, High Park and more. 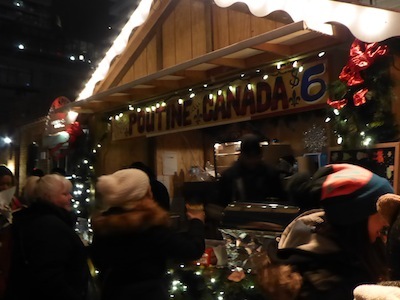 Our favourite night of the year is always wandering through the Toronto Christmas Market. One of the most magical parts of the Toronto Christmas Market for the two of us is that we got married in the Distillery District. Staples like the Gooderham & Worts sign and Mill Street Pub bring us back to a wonderful day in our lives. When it was announced 5 years ago that the Distillery District would host a European christmas market, we knew it would be our thing. 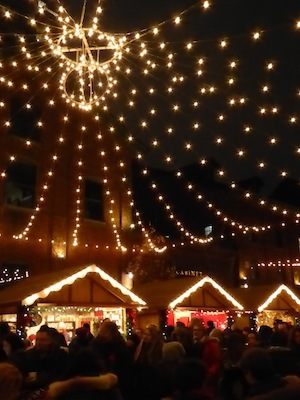 If you were at the first christmas market and haven’t been back or have gone every year, you will notice this year that things have changed pretty drastically. Gone is the prohibition on alcohol and now the whole area is licensed. People mingle over hot totties, Mill Street draft beer, and mulled wine. Additionally, there are a lot more shops, local artisans and some bigger companies, as well as better entertainment. Last night we watch a Ukrainian choir for a few moments and were taken back to our few Christmases spent travelling though Europe. 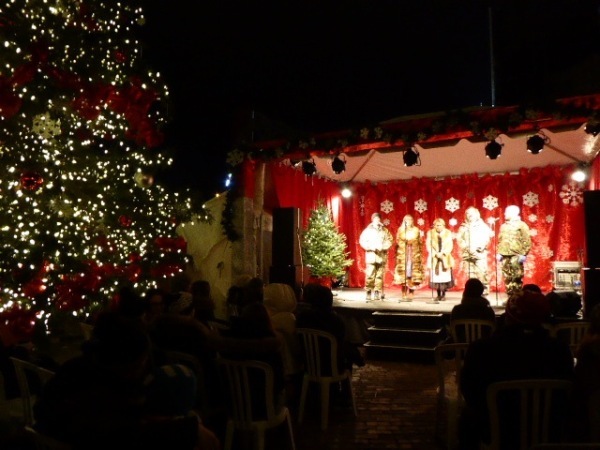 Admission to the Toronto Christmas Market is free. Although the Distillery is open 7 days a week, the christmas market does not run on Mondays. It is open Tuesdays through Fridays from noon to 9 pm and Saturday and Sunday from 10 am to 9 pm. There is a daily entertainment schedule you can check before heading out. We were a little worried as we headed over at 7:30 pm that we would only have an hour and a half at the market. Turns out the closing time is more of a suggestion and its up to the vendors discretion to decide when they will close. We wandered through the market until a little after 10 pm and found we were able to do a lot of shopping. Although the market is open to all ages, I would suggest that around 7 pm on the weekends is the latest you may want your kids there. Last night it was extremely crowded in spots and parents with strollers fought there way through adults who were drinking and smoking. That being said, there are a ton of kids events until 7 pm that you will want to check out. My favourites were the ferris wheel, carousel and of course Santa’s House where kids can meet the big guy himself. I was privy to a very special moment last night around 7:30 pm when Santa’s elves and Santa’s photographer told Santa to wrap things up as it was time to head back to the North Pole. 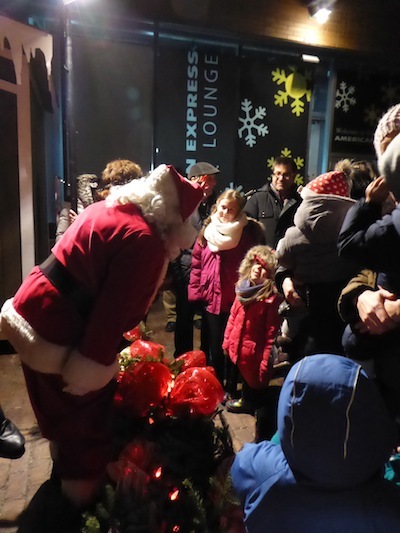 Santa laughed and headed over to a crowd of children where he spoke to each of them individually and gave them his full attention. Santa easily could have been escorted out quickly but instead he stopped and spoke to every child that yelled his name. As he and I, stood near a tree to sneak a last minute picture, a small girl came over looking quite nervous. He got down on one knee and spoke to her in the kindest voice I have heard. The best part of Santa’s house is that it is free to visit Santa. There is a donation box if you can afford it but children are certainly not being turned away. There is a professional photographer on site but parents are also permitted and invited to take photos with their cameras and cell phones. With all that walking you will get hungry. There are numerous options for restaurants in the Distillery as well as food stands selling turkey legs, poutine and grilled cheese sandwiches. 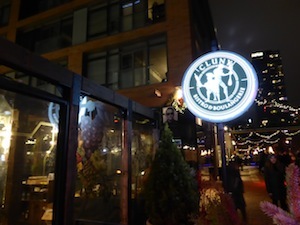 Having tried most of the restaurants more than once, we decided to head to Cluny Bistro last night. When we went into get a table at Cluny Bistro, we were told it would be an hour long wait. With an unlimited supply of alcohol available and numerous fire pits, we knew we could survive the wait. I went in to the restaurant not long after to use the ladies room a discovered a lot of empty tables. My suggestion is that if you are on a wait list during the christmas market, you check in every 30 minutes as a lot of people are putting their names on various wait lists and then eating elsewhere or leaving the area. 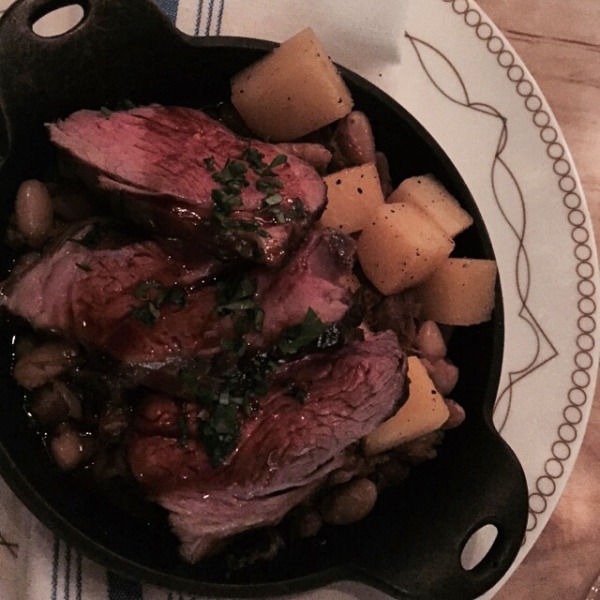 I loved the look of Cluny Bistro and the french ambiance and decor. The set up is gorgeous and the smells of fresh baked goodies overtake you before you get through the door. We were sat near the back of the restaurant and introduced to our lovely server Mark. He had great wine suggestions, was knowledgeable on the food and was a funny guy. 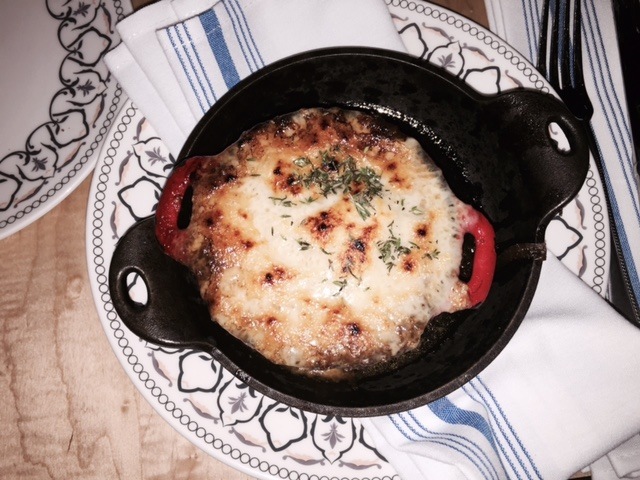 We ordered two apps, a pork belly, egg and brioche concoction as well as the traditional french onion soup. The soup was some of the best I have had in the city. The broth was rich and the whole thing was covered in delicious real gruyere cheese. The pork belly was equally good and by the end of appetizers, we were salivating for dinner. For the mains, Mark suggested a veal meatball as well as lamb two ways. The meatball was a flop as it came overcooked and dry. Mark looked genuinely surprised and embarrassed and I got the impression this doesn’t actually happen much at Cluny. The lamb two ways was devoured by my husband who is an extremely judgemental and picky lamb eater. He assured me it was fantastic when he realized there was none left for me to try. Next came dessert. We hemmed and hawed about not actually needing dessert but from the look on Mark’s face and his descriptions of the food, I knew we had to try it for research sake. Mark pointed to a bittersweet chocolate truffle bar with homemade raspberry ice cream and I was sold before he finished the word chocolate. I like to consider myself a chocolate connoisseur as in I eat it every day. The dessert arrived and Mark kindly put it in the middle of the table. 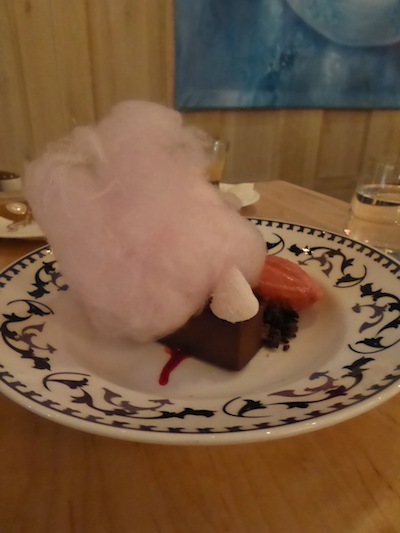 Dessert quickly evolved into our own version of the Hunger Games. Spoons clashed as we fought over decadent chocolate, crunchy bits of something delicious that might have been coffee beans, and the best ice cream we had tried in a while. When the damage was over we were both full and clearly resisting licking the plate. Our neighbours ordered a giant fondue sharing plate and offered to let us try it but even I had reached my chocolate limit. The bill came and with all our food, a lot of wine, and dessert, it was a respectable $160. What I liked is that Mark had taken the veal off the bill without pointing it out to us. We told him there was an entrée missing and he smiled and asked me to return and try it again as the next time the veal would be cooked properly. We left knowing we would return with the Charlie, the tiny foodie in tow, and hoping Mark would again be working. There are a few back alley bars that are much less busy than the ones in the centre of the market. Avoid the big Mill Street Pub booth set up by Santa Claus as they offer free beer tastings and most people are lingering trying to get free drinks. Instead head right outside of Mill Street Pub to the smaller booth by the front door. There wasn’t a person in line at it last night and we were served quickly with a smile more than once. Advance reservations are suggested if you want to eat at any restaurant in the Distillery. Bring cash. Most vendors are taking debit and credit but some food and beer booths are cash only. Kinder is onsite with their giant egg photography booth. Find it by the carousel. The tree this year is a 52 foot white spruce. Its worth seeing up close. Three hotels are offering Toronto Christmas Market packages this year for out-of-towners. 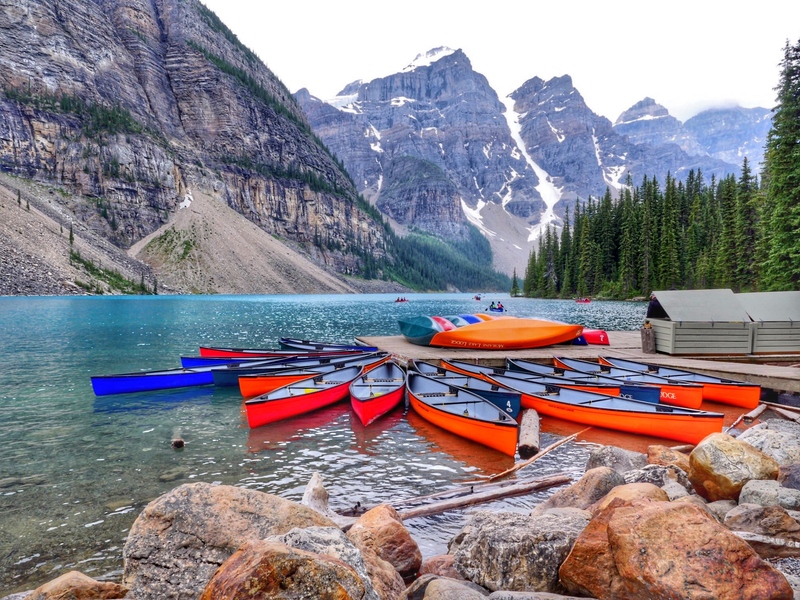 Official hotel partners are the Fairmont Royal York, The Westin Harbour Castle and the King Edward Hotel. On Tuesdays, Santa Claus invites you to bring your pets down for photos between 2:00 pm and 7:30 pm. Bring your cameras and submit your best shot to the annual photo contest. 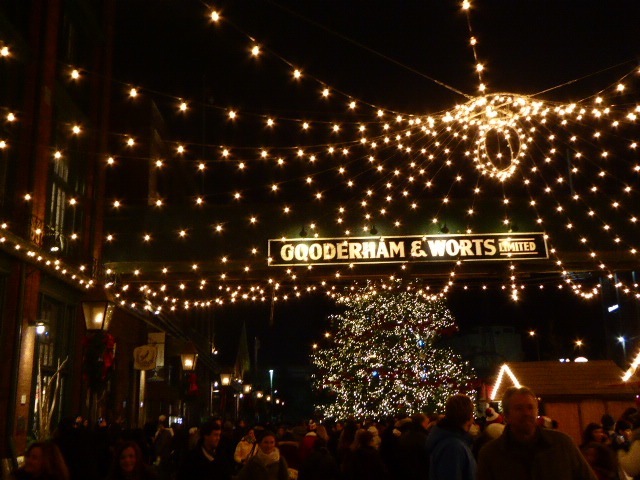 Dress warm, get outside and enjoy the holiday season with the Toronto Christmas Market. Disclaimer: I was not paid to write this post. I just really like the Toronto Christmas Market and frankly am trying to get back on Santa’s good list.